Choose from a wide selection of machine and utility brushes, designed for specific scenarios in industrial food production and preparation settings. 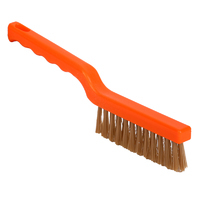 All brush products are manufactured to last, with robust handles and PBT filaments. If you're looking for replacement or back-up machine brushes, we supply both long handled machine and short machine brushes (also known as a fish brush). We also stock short machine brushes designed to handle high temperatures, fitted with stiff Peek bristles. 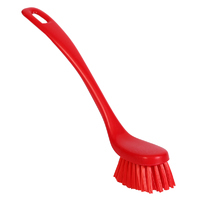 Our range also includes a dishwasher brush with a scraper nose, a resin-set long handled utility brush, and the classic round-nose dishwash brush. 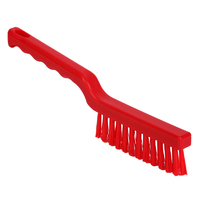 Ideal cleaning brushes with effective colour coded bristle area of 125 x 55mm in 2 filament sizes, both in polyester PBT for best results in wet conditions. A long handle provides that extra reach that Health & Safety regulations recommend. Also available with resin set. 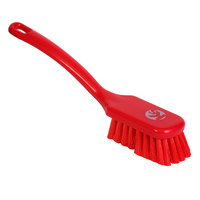 Excellent cleaning brushes with an effective colour coded bristle area of 90 x 50mm and a short handle allowing for maximum pressure to be applied during work. Filled with polyester PBT filaments which work happily all day immersed in water. 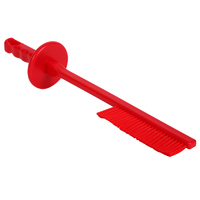 An effective bristle width of only 8mm and length of 200mm makes this colour coded hygiene brush an extremely useful article in cleaning difficult areas to access in food production machinery. 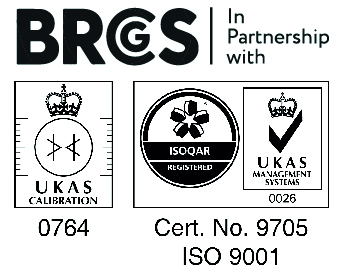 With an overall length of 510mm and a large diameter guard moulded into the long handle, operatives are encouraged to probe deeply without risk of damaging their hands. An extremely resilient compact stiff hygiene brush for detailed work around food processing machinery. Also extensive use on fishing vessels or onshore fish processing requirements that only the best in polyester PBT filaments are sufficient to last the length! Contoured handle encourages easy grip in work. Effective bristle area: 135 x 15mm. 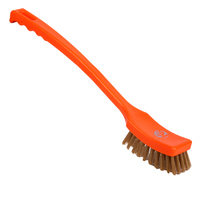 Wide angled polyester PBT bristle providing an effective bristle area of 95 x 50mm, this colour coded hygiene dishwash brush has excellent cleaning properties. Long periods of total immersion in water and detergents does not affect this remarkable article. 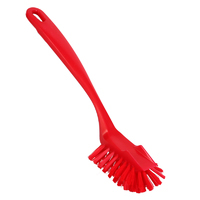 By inverting this brush a scraper edge moulded into the brush body attacks stubborn residues at precisely the correct angle. 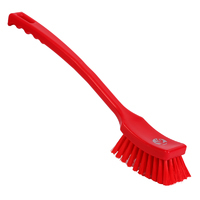 With a more concentrated effective bristle area of 60 x 45mm and more pronounced upward angle of handle, this rugged brush is not only suitable for general cleansing duties but is ideal working down into smaller vessels.